Aristotle employs the simple bodies, or elements, in two rather different scientific contexts, each of which highlights some of their qualities at the expense of others. On the one hand, he uses the elements in the service of cosmology, where their natural motions are imperative to drafting an architectural plan of the cosmos. On the other hand, he uses them in the service of chemistry, where their heat, coldness, dryness, and moistness are decisive in securing accounts of elemental transformation and the generation of composite bodies. Two families of interpretive proposals for the formal principles of Aristotle's elements have been advanced accordingly. One family of interpretations construes the form of a simple body in terms of its cosmological characterisation, while a second construes that form in terms of the simple body's chemical characterisation instead. A critical step in bridging that interpretive divide is thus to bridge the underlying divide between Aristotle's cosmological and chemical characterisations of the sublunary elements. It is that latter task that I set out to accomplish in the present paper. I argue that the hot and the cold are efficient causes, respectively, of the light and the heavy, and further, that the moistness of elemental water and air explains the intermediary natural positions of those elements relative to earth and fire in Aristotle's idealised cosmic landscape. In this way, Aristotle's chemical characterisation of the elements is shown to ground his cosmological characterisation of them. Keywords: Aristotle; simple body; element; cosmology; chemistry; elemental powers; elemental motion. No concept is more central to chemistry than the element, and no conception of the elements has a richer legacy than Aristotle's. Yet, in spite of its influential role in the development of both chemical thought and the physical sciences more broadly, Aristotle's theory of the simple bodies, or elements, remains occluded behind a fog of interpretive puzzles. In what follows, I aim to help clear the air by resolving one of those puzzles. As Aristotle defines it, an element is "a body into which other bodies may be divided, present in them potentially and not itself divisible into bodies different in form" (DC III. 3, 302a15-18).1 As definitions of simple bodies go, Aristotle's allows for a surprising amount of complexity. Two varieties of elemental complexity are particularly notable. First, since Aristotelian properties are not bodies, his definition is compatible with elements that are qualitatively complex. He can thus treat elemental fire, for example, as being not only light, but also hot and dry as well.2 Second, Aristotle's definition allows for elements that are metaphysically complex. Specifically, it is open to him to treat a simple body as divisible into other beings so long as those beings are not themselves bodies. Aristotle plainly takes advantage of the first variety of elemental complexity. Each sublunary element is characterised by one member of three pairs of contrary qualities: light and heavy, hot and cold, and dry and moist. Such a characterisation is still of course relatively austere, but among those who take Aristotle to have further availed himself of the second variety of elemental complexity and, in particular, to have construed the elements as being hylomorphically structured, 3 even that limited set of qualities has generated a vast interpretive divide. A critical step in bridging the divide between those interpretive families is to bridge the underlying divide between the cosmological and chemical characterisations of the sublunary elements. It is that latter task that I set out to accomplish in the present paper. I argue that the hot and the cold are efficient causes, respectively, of the light and the heavy, and further, that the moistness of elemental water and air explains the intermediary natural positions of those elements relative to earth and fire in Aristotle's idealised cosmic landscape. In this way, Aristotle's chemical characterisation of the elements grounds his cosmological characterisation of them. The primary source for Aristotle's cosmology is De Caelo, where Aristotle's chief aim is to provide an account of the basic structure of the cosmos. The simple bodies play a critical and ineliminable role in that Aristotelian project. But they play that role, at least to all initial appearances, independently of being hot, cold, moist, or dry. Indeed, were one to read just De Caelo,6 one would likely have no inkling that the Aristotelian elements were even characterised by those contraries. The hot and the cold hardly come up in the work's four books,7 and the moist and the dry are never explicitly mentioned.8 Instead, the operative features of the elements in Aristotle's discussion are their motions (and so, as we will see, in the case of the sublunary elements, their lightness or heaviness). The cosmos, as Aristotle understands it, is a body, the principal parts of which are also bodies. In particular, its parts are natural bodies, each of which, Aristotle claims, is "as such, capable of locomotion; for nature ... is their principle of movement" (DC I. 2, 268b14-16). To sketch their interrelationships and, thus, to chart the cosmic landscape more generally, Aristotle accordingly turns his attention to locomotion. Locomotion is motion with respect to place, or motion that traces a path. Such paths are either simple or complex; so, in turn, are locomotions. Aristotle recognises two simple paths-namely, the straight and the circular-and consequently two genera of simple locomotion. But straight motion, on Aristotle's account, can be further divided into motion upwards and motion downwards, yielding three basic kinds of simple locomotion, each of which is defined in relation to a point at the centre of the cosmos: motion around that central point (circular), motion away from that central point (upward), and motion towards that central point (downwards). All complex locomotions are compounded from those three simple ones. Aristotle's discussion of locomotion leads directly to an argument for the existence of simple bodies.9 Aristotle assumes not only that the natural motion of simple bodies, should any exist, will be likewise simple but also that simple locomotion belongs, properly, only to a simple body.10 However if so, Aristotle argues, "there must obviously be simple bodies; for there are simple motions" (DC III. 3, 302b7-8; cf. I. 2, 269a2-7). In fact, since all three basic kinds of simple motion are observed, there must be at least three simple bodies. These, he specifies, are aether (circular), fire (straight: upwards), and earth (straight: downwards). The existence of the simple bodies, so characterised, pays sizable cosmological dividends. Generating an architectural plan of the cosmos largely requires tying those elements to cosmic regions. Aristotle asserts, "The bodily elements are three, and therefore the places of the elements will be three also" (DC I. 8, 277b13-15). The fundamental divisions of the Aristotelian cosmos follow those made among the simple motions of the bodies composing it (see Figure 1). Aristotle posits an outer region of circular movers that limits and encloses a region of straight movers, thus demarcating the heavens from the mundane, sublunary realm. The enclosed sublunary region, following Aristotle's division of the two kinds of straight motion, is then further divided into an outer region of upward movers and an inner region of downward movers. The primary source for Aristotle's treatment of the elements as they relate to his chemistry is Generation and Corruption II. Just as Aristotle's description of the sublunary elements in terms of the light and the heavy served his cosmological goals in De Caelo, his description of them in terms of the hot, the cold, the dry, and the moist serves his chemical goals here. This emerges early in the book, in the course of Aristotle's argument, in chapter 2, for the claim that those latter four are "principles of perceptible bodies." Aristotle's first move in that argument is to restrict the pool of candidates to the tangible contraries,14 seven pairs of which are presented as deserving special consideration. These are the hot and the cold, the dry and the moist, the light and the heavy, the hard and the soft, the brittle and the viscous, the rough and the smooth, and the course and the fine. Aristotle's efforts to determine which among them are primary proceeds in four stages.15 The first, in which Aristotle rejects the light and the heavy as contenders, is particularly revelatory of the extent to which chemical aims shape his broader discussion in the book. As we have seen, being light or heavy is, for Aristotle, a matter of a body's natural motion. As such, Aristotle claims, "things are not called heavy and light because they act upon, or suffer action from, other things" (GC II. 2, 329b20-21); rather, they are so called on account of how they are in themselves. While this might seem an idle point, it is precisely the one upon which Aristotle's denial that the light and the heavy serve as basic principles of perceptible bodies rests. The point is decisive, he asserts, because, "the elements must be reciprocally active and passive, since they combine and are transformed into one another" (329b21 -23). Aristotle, that is to say, stipulates that the primary ways in which perceptible bodies differ from one another will be directly relevant to the explanation of two classes of characteristically chemical phenomena-elemental inter-transformation and mixture.16 Since the light and the heavy are not directly relevant to those phenomena, Aristotle claims, it must be some other set of contraries that "constitute forms and principles of body" and that "constitutes an element" (329b8 and 12). He will, of course, eventually identify those contraries as the hot, the cold, the dry, and the moist. But insofar as Aristotle has confined the contenders to those contraries that can directly ground accounts of elemental transformation and mixture, Aristotle has already assured that any subsequent treatment of the elements in terms of this class of contraries will be a resoundingly chemical one. That chemical treatment begins with a four-fold differentiation of elements on the basis of Aristotle's identification of the hot, the cold, the dry, and the moist as primary contraries. As "principles of perceptible bodies," at least one member of each contrary pair must characterise any such body, elements included. For this reason, no element could be characterised by fewer than two of the primary contraries, thus ruling out an element that is, for example, merely hot. But further, neither could there be an element characterised by more than two of the primary powers since it would then, per impossible, be both hot and cold or both dry and moist.17 This leaves four viable combinations of primary powers to uniquely determine four simple bodies-a cold and dry element (earth), a cold and moist element (water), a hot and moist element (air), and a hot and dry element (fire). On the basis of that characterisation of the elements, the general contours of an account of elemental transformation are relatively straightforward.18 Suppose, for example, that some elemental water comes into contact with a hot body. As opposed powers, the cold of the water and the heat of the foreign body cannot help but to enter into battle, as it were.19 If the water's natural coldness is overpowered and completely assimilated by the foreign body's heat, then the water it essentially characterised perishes while a hot and moist body-namely, elemental air-comes to be in its wake. Likewise, fire comes to be from air when air's natural moistness is mastered by its opposite (the dry), and earth, in turn, comes to be from fire when fire's natural heat is similarly mastered. The action and passion of the primary contraries is thus central to Aristotle's treatment of elemental transformation. Without it, there would be no struggle between opposed powers to drive the relevant changes. The same holds with respect to Aristotle's treatment of elemental mixture and the synthesis of complex bodies.20 The powers characterising the Aristotelian elements in Generation and Corruption lie at the extreme ends of two continuous dimensions. Between the extreme heat characteristic of elemental air, for example, and the extreme coldness characteristic of elemental water, "there are differences of degree in hot and cold" (GC II. 7, 334b7). Accordingly, on his account, when some elemental water comes into contact with a similar amount of elemental air, the result will not be a larger quantity of either elemental body, for their contrary powers (hot and cold) are too well matched for either to be completely mastered by the other. What happens instead, Aristotle submits, is that the bodies "destroy one another's extremes" (334b10-11). At least some of their elemental powers, that is to say, become tempered. But since the extremes that essentially characterise the elements are destroyed in that tempering, the result cannot itself actually be an element. It is thus directly in terms of the action and passion of the primary contraries that Aristotle accounts for the genesis, from the elements, of complex chemical substances, or what he calls the non-elemental homoeomers. 21 Once again, then, Aristotle's treatment of the elements in Generation and Corruption is shown to be carefully tailored to his broader chemical aims. Can the cosmological and chemical characterisations be reconciled? Aristotle's chemical characterisation of the sublunary elements divorces them, as a group, from aether and the superlunary realm with it. A chasm separates terrestrial from celestial matter. As just discussed, earth, water, air, and fire are characterised by opposed powers in virtue of which they are reciprocally active and passive, grounding the possibility of their inter-transformation and mixture. Aether, by contrast, is characterised by none of those powers. Aristotle's chemical characterisation of the sublunary elements in Generation and Corruption thus shows aether to be radically different in kind from them. For his purposes there, aether is a non-starter. It can neither transform into the other elements nor combine with them to form a composite.22 But aether's otherness raises the question: How, if at all, are Aristotle's cosmological and chemical characterisations of sublunary matter related? It might seem, at first glance, that the two treatments of the sublunary elements are irreconcilable. Recall that Aristotle claimed to reject the light and the heavy-the workhorses of De Caelo-as principles of perceptible body because "the elements must be reciprocally active and passive, since they combine and are transformed into one another" (GC II. 2, 329b21-23). On its face, Aristotle's claim tells against more than merely the status of the light and the heavy as principles. Namely, it suggests that being light or heavy would actually preclude a body from being active or passive in the appropriate manner. Indeed, as a corollary, since Aristotle claims that being hot or cold and dry or moist is a sufficient basis for such action and passion, the surface reading suggests that being light or heavy would preclude a body, further, from even possessing those other properties. In this section, I aim to push back against that impression. First, it bears noting that this cannot be the intended sense of Aristotle's claim. He thinks, after all, that "bodies which are heavy or light are such as to act and suffer action" (GC I. 6, 323a9-10). Further, even though Aristotle has moved away from the cosmological characterisation of the elements in Generation and Corruption II, he occasionally gestures toward the continued legitimacy of that characterisation. He claims, for example, that "Fire and Air are forms of the body moving towards the limit, while Earth and Water are forms of the body which moves towards the center" (GC II. 3, 330b32-33). Similarly, he claims that fire "moves upwards without compulsion" (II. 6, 333b27-28; cf. 8, 335a19-20), which is to say that its upward motion is natural and thus to say that fire is light. Aristotle's point at Generation and Corruption II. 2, 329b21-23, then, must instead be that the principles he is looking for are identical with those principles underpinning elemental inter-transformation and mixture. But why think that that identity should hold to begin with? What might motivate Aristotle to assert it?23 The answer comes into view once we recognise that Aristotle is not, properly speaking, "looking for principles of perceptible body," as he had claimed at the outset of the chapter (GC II. 2, 329b6). Were he, we should expect the principles he identifies to be principles of all such bodies. But they are not. Aether, as a case in point, is neither hot, nor cold, nor dry, nor moist, but it is nonetheless routinely claimed by Aristotle to be perceptible. Since, then, we have spoken of the primary element, of its nature, and of its freedom from destruction and generation, it remains to speak of the other two. In speaking of them we shall be obliged also to inquire into generation and destruction. For if there is generation anywhere, it must be in these elements and things composed of them. If this is right, there is a ready explanation for Aristotle's dismissal of the light and the heavy as candidates for such principles-namely, it is not insofar as bodies are light or heavy that they are generated or destroyed.27 The light and the heavy are instead principles of natural bodies and as such coordinate with the circular motion of aether. But this in no way implies that the light and the heavy should be at odds with those principles in virtue of which the sublunary bodies are perishable. That is to say, it may well yet be possible to reconcile Aristotle's cosmological and chemical characterisations of sublunary matter. It is to just that task that I now turn. Ultimately, however, this is not, I think, the appropriate way to frame the relationship between Aristotle's cosmological and chemical characterisations of the elements. An initial obstacle is that it is hard to see how the hot, the cold, the dry, or the moist could be more specific determinations of the light or the heavy in the way that, for example, being whole-winged or split-winged are more specific determinations of being wing ed.30 As we saw above, Aristotle takes the light and the heavy to belong to a fundamentally different class of properties than the chemical powers. To recall, whereas "things are not called heavy and light because they act upon, or suffer action from, other things" (GC II. 2, 329b20-21), "hot and cold, and dry and moist, are terms, of which the first pair implies power to act and the second pair susceptibility" (329b23-25). On its own, that obstacle is not insurmountable, since Aristotle vacillates on the question of whether the differentia of a species should be a determination of that of the genus under which the species falls. His practice in the biological works, in particular, routinely ignores any such demand.31 But while that initial obstacle can be accordingly sidestepped, at least in principle, a broader problem remains, namely the chemical powers do not stand to the light and the heavy in a way that suitably resembles the relationships among the differentia of subordinate and superordinate kinds in any of Aristotle's treatments of division in the corpus. Most pointedly, this is because, for Aristotle, the light and the naturally hot are invariably related and so, too, are the heavy and the naturally cold.32 Those pairs are so strongly wedded in Aristotle's mind that, on occasion, he even uses the heavy interchangeably with the cold as if it were a contrary to the hot.33 As such, however, the hot and the cold do not help to differentiate the light and the heavy at all. From a taxonomical perspective, they are coequal.34 Even if the dry and the moist were to suitably carve genera demarcated by the light and the heavy, then we would remain unable to account for the hot and the cold on a genus-species model of the relation between the cosmological and chemical characterisations of the Aristotelian elements. Aristotle's marrying of the light and the hot and of the heavy and the cold nonetheless cries out for explanation. A hint is to be found in the fact that, despite their convertibility, Aristotle's customary presentation of the relation between the relevant terms is asymmetrically framed. Aristotle claims, for example, that "naturally, all heat tends upwards" (Meteor. I. 4, 342a15-16), that "everything hot has a natural tendency upwards" (Meteor. II. 9, 369a20-21), and that "the hot naturally tends to move upwards" (De Somno 3, 456b21-22). Similarly, he submits that odours are conveyed upwards when we inhale "on account of the lightness of the heat in them" (De Sensu 5, 444a23). In each case, lightness is presented as belonging to heat rather than the other way around. But if, for Aristotle, heat is the efficient cause of lightness, then why does he take elemental fire to be lighter than elemental air, despite both being hot in the extreme? And, analogously, if coldness is the efficient cause of heaviness, and if elemental water and elemental earth are both cold in the extreme, then why is the former lighter than the latter, or equivalently, "exceeded by the other [i.e., earth] in the speed of its natural downward movement" (DC IV. 1, 308a31-33)? The solution to this final puzzle turns on the two remaining elemental powers: the dry and the moist. On Aristotle's account, the medium in which a body moves "causes a difference [in that body's motion] because it impedes the moving thing, most of all if it is moving in the opposite direction, but in a secondary degree even if it is at rest; and especially a medium that is not easily divided (më eudiaireton)" (Phys. IV. 8, 215a29-31). The first consideration does not bear on the question at hand since fire and air naturally move in the same direction, as do earth and water. But the second does. Aristotle supposes that the more easily divided a medium is, the more easily a body can move through it. Since lake water is more easily divided than mud, for example, a stone will fall more easily, and so quickly,38 through the former than the latter. Wood, by contrast, despite being considerably lighter than either, would likely impede the stone's fall altogether; since wood is not easily divided, the stone would have no way through, as it were. 1 Translations of Aristotle's works follow those in Barnes (1984). 2 While complexity of this kind may now seem trivial, it was by no means so in classical Greece. The author of On the Nature of Man, for example, took each element to be characterised by-or more fundamentally, to be-a lone powerful quality. Anaxagoras is likewise commonly interpreted as having so construed the simple bodies, or at least the opposites. There is also evidence of contemporary arguments against multiply predicating any subject, elemental or otherwise. Plato, for example, attributes doubts of this type to the so-called "late learners" (Soph. 251a-c; cf. Tht. 201e-202b). 3 The traditional view is that the Aristotelian elements are metaphysically complex and, more specifically, that they are hylomorphic. Following King's landmark paper (1956), worries about the philosophical plausibility and interpretative coherence of sub-elemental matter spurred a series of revisionist interpretations, on which matter at the most fundamental level is instead to be identified with the elements themselves. Particularly significant developments of that revisionist line were later advanced by Furth (1988) and Gill (1991). For defences of elemental hylomorphism responsive to those revisionist readings, see especially Lewis (1996), Scharle (2009), and Krizan (2013). 4 Members of this family often specify the form of a sublunary element more directly in terms of its natural place or natural motion, but lightness and heaviness are closely related, as will be seen. Lang takes a strong view of that relationship, arguing that "The four 'terms' of elemental motion turn out to be identical-(1) being heavy or light, (2) possessing inclination as the very nature of the elements, (3) being moved, and (4) being in place" (2007, 217, emphasis mine). On her view, the form of earth, for example, is its heaviness, which is at the same time an active orientation downward and a principle of being moved to, resting at, and resisting displacement from the cosmic centre. For Katayama (2011), that identification is too strong. He agrees that earth's heaviness is its form, but he takes that quality, properly speaking, to be a principle of rest, serving only secondarily and merely in a loose sense as a principle of being moved. For Cohen (1994), only Katayama's strict sense of lightness and heaviness captures the form of a sublunary element. 5 The view that the form of a sublunary element is the pair of primary tangible contraries that, in Aristotle's chemical characterisation, jointly differentiates it from the other three, was long the default position and is still often casually asserted in the literature. For influential modern discussions, see, e.g., Joachim (1922, esp. 104, 137, 191, 200-201) and Sokolowski (1970, esp. 268-269). More recently, Krizan (2013) has argued for a revision to that position on which the form of a sublunary element is instead the single primary tangible contrary that Aristotle claims, at Generation and Corruption II. 3, 331a3-6, to belong to it simpliciter. 6 In proposing this scenario, I do not mean to suggest that De Caelo recommends itself as an independent treatise. It emphatically does not. Not only does it bear numerous references to other Aristotelian texts (the Physics especially), it might be quite literally continued by Generation and Corruption, the first line of which contains an atypical introductory particle, "de," that appears to answer the "men" in De Caelo's last line. As Brunschwig notes, crediting the observation to Marwan Rashed, "at the end of (what is now) Cael., the scribe of E (Parisinus gr. 1853, fo. 106 v°) has copied (what are now) the first words of GC (with δέ), without marking any break. He then crossed these lines out, wrote the title περ γενέσεως κα φθορας in an official style, and copied again the lines he had crossed out (this time without δέ, but the particle was added by a later hand)" (Brunschwig 2004, 31, n. 21). 7 Of the handful of occurrences in De Caelo, the hot and the cold are predicated of simple bodies only in III. 8. Since the discussion in III. 8 is decidedly polemical, it is not obvious that Aristotle endorses those predications. 8 There is, however, an oblique reference to the moist and the dry in the final chapter (DC IV. 6, 313b8-9). On the moist as that which is easily divided and the dry as that which is divided with difficulty, see below. 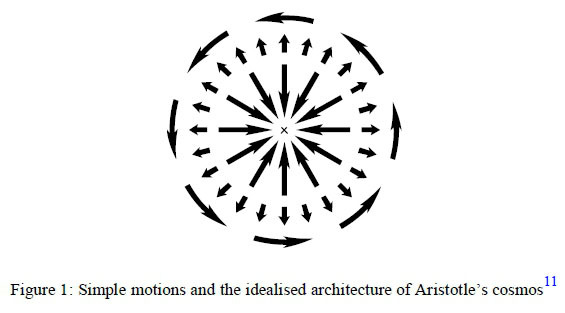 9 For a thorough reconstruction of Aristotle's reasoning, focusing on the argument, in De Caelo I.2-4, for the existence of aether as distinct from the sublunary elements, see Hankinson (2009). 10 Presumably, the thought behind the first assumption is that since complex locomotions are compounded from simple ones, no complex locomotion could, naturally, belong to a simple (that is, uncompounded) body. Aristotle's basis for the second and, in the present context, more consequential assumption is harder to determine. Aristotle does not preclude a complex body from having a simple natural motion. But were there such a body, Aristotle claims, simple motion would belong to it only derivatively since the natural motion of any complex body is, on his view, "determined by that simple body which prevails in the composition" (DC I. 2, 269a28-30; likewise 269a1-2 and IV. 4, 311a30-35). This latter thesis that the natural motion of a complex body owes to the motion of its dominant simple constituent cannot be appealed to in the context of the present argument, however. If the goal is to support the claim that simple bodies exist, then Aristotle's reliance on it would verge on begging the question, as the thesis takes it for granted that complex bodies (which are presumed to exist) are ultimately composed of simple ones. 11 Even by Aristotle's estimation, this is of course only an idealised model. The cosmos contains complex movers, to say nothing of unnatural motions, and is itself far more complex in turn. 12 For this analysis of the light and the heavy, see Physics VIII. 4, 255b14-17; De Caelo I. 3, 269b20-25; IV. 1, 308a29-31; and IV. 4, 311b14-16. 13 We have already seen Aristotle asserting that, in total (and so including aether), "The bodily elements are three" (DC I. 8, 277b13-15; cf. III. 1, 298b6-8). This is a claim that Aristotle appears to connect to the number of the basic kinds of simple locomotion. Thus De Caelo I. 3, 270b26-31: "the number of what we call simple bodies cannot be greater than it is. The motion of a simple body must itself be simple, and we assert that there are only these two simple motions, the circular and the straight, the latter being subdivided into motion away from and motion towards the center." It is also common for Aristotle, especially in the first books of De Caelo, to avoid explicit mention of water and air even when he gestures to the existence of more than two sublunary elements. We find him speaking instead of fire, earth, and, for example, "whatever is akin to them" (DC I. 2, 268b29) or "the other terms of the series" (III. 1, 298a30). The bottom line is that water and air complicate Aristotle's strategy in charting the cosmos by subverting the tidy correlation between simple motions and simple bodies. When that cosmological aim is most directly pursued, water and air are thus quietly pushed aside. 14 For a critical discussion of Aristotle's presumptive basis for this move, see Williams (1982, 157-58). 15 In stage 1 (GC II. 2, 329b19-23), Aristotle presents a criterion to marshal against any claim to primacy on behalf of the light and the heavy. In stage 2 (329b23-31), Aristotle argues that the hot, the cold, the dry, and the moist satisfy that same criterion. In stage 3 (329b31-330a24), Aristotle presents reasons for thinking that the remaining contraries are reducible to those four and so not primary. And finally, in stage 4 (330a24-29), he argues that the hot, the cold, the dry, and the moist cannot be further reduced to one another and so have equal claims to primacy. 16 I return to Generation and Corruption II. 2, 329b21-23 in the next section and defend this reading of it there. 17 The same reasoning tells against the possibility of an element characterised by exactly two contrary powers. On this point, see Generation and Corruption II. 3, 330a31-33; 4, 331b28-31; and 5, 332b3-5. 18 For a more comprehensive and finely detailed discussion of Aristotle's account, along with a survey of the secondary literature on it, see Krizan (2013). 19 As Kahn (1960, 130) observes, Aristotle's warfare metaphors have a long pedigree in Greek literature and philosophy, rooted in such ancient sources as the Iliad (V, 497), where Homer describes the Trojans as standing "opposite" their opponents, the Achaeans, on the field of battle. 20 My aim, again, is merely to provide a sketch that highlights a prominent role that the action-passion constraint on primary contraries plays in Aristotle's account of the phenomenon. For recent interpretive treatments of Aristotle's theory of mixture, see Cooper (2004), Frede (2004), Wood and Weisberg (2004), and Scaltsas (2009). 21 On Aristotle's account of homoeomerity, see Berman (2015). For his treatment of the formation of the non-elemental homoeomers beyond elemental mixture, see Lennox (2014). 22 Though, it should be noted, in a compositional sense, Aristotelian aether remains chemically salient. It is the simplest heavenly body, of which all other heavenly bodies are composed (see, e.g., Meteor. I. 2, 339a12). 23 To be clear, my question is not why the principles, assuming the role they will play in elemental transformation and mixture, must be those in virtue of which bodies are capable of mutual action and passion. The question, rather, is why Aristotle associates the principles of perceptible body with precisely those two phenomena in the first place. 24 On Generation and Corruption as a continuation of De Caelo, see note 6, above. 25 Aristotelian aether and the heavenly bodies composed of it are not reintroduced until the very end of Generation and Corruption, where, in II. 10 and 11, they are put forward as causes of cyclical coming to be in the sublunary realm. Each of the earlier occurrences of "aithër" (once at DC III. 3, 302b4-5; twice at GC II. 6., 333b2; and once each at GC II. 6., 334a1 and 4) is used in presenting Empedocles' treatment, which Aristotle takes to be an account of fire instead. 26 Compare Philoponus' gloss: " ...we are looking for the principles of body that is not eternal but capable of coming-to-be and perishing" (in GC 213, 11, trans. Williams). 27 By contrast, "unqualified becoming and natural change are the result of these powers [namely, the hot, the cold, the dry, and the moist] and so is the corresponding natural destruction" (Meteor. IV. 1, 378b28-30; cf. PA II. 2, 648b2-10). 28 The simple motions are not sufficient to differentiate more than the three elements-a heavy element, a light element, and an element disposed to circular motion-upon which Aristotle's cosmology principally relies. Thus, when water and air finally make a proper appearance and Aristotle allots separate regions of the cosmos to them (DC IV. 4), he does so on the basis of their relative lightness and heaviness rather than on the basis of any novel simple motions or coordinate natural dispositions that might ground a distinction in kind. 29 Alexander, discussing this very passage in a section of his commentary on Generation and Corruption preserved in Jäbir b. Hayyän's Book of Morphology, entertains the hypothesis that the light and the heavy delimit two genera under which the four sublunary elements fall. The relevant portion of the commentary runs as follows: "He [Aristotle] means that fire and air belong to the light body and are subsumed under it ... The world [i.e., earth] and water ... belong to the heavy body. It is therefore possible, that by saying 'of those first two' [330b31-32, reading protön, with manuscripts E and J, in place of topón], he did not mean the extreme places, but he meant the heavy and the light in so far as he assimilates them as two kinds" (§40, trans. Gannagé). 30 I take the example from Posterior Analytics II. 13, 96b36-97a1. 31 The contention that the differentia of a species should be a determination of that of the genus was not only a fixture in Academic theories of division but also, at least on occasion, adopted by Aristotle himself (see, e.g., Meta. Z. 12, 1038a9-21). Elsewhere, however, Aristotle argues that insisting on the point is not only "often difficult" but, further, in fact "often impossible" (PA I. 2, 642b6-7). For a discussion of Aristotle's method of division in the biology, see Balme (1987). For an argument that that method applies, for Aristotle, not just to biology but to the study of sublunary nature generally (and so potentially to the elements), see Wilson (2013, chap. 4). 32 To entertain the hot and the cold as differentiae is to conceive of them as predicable of the kinds that they differentiate per se, which is of course how they are in fact predicated of the elements (see, e.g., Cat. 11, 1237-38). That which is hot or cold merely accidentally is hot or cold in a secondary sense (cf. PA II. 2, 64835f.). We may draw an analogous distinction between, on the one hand, that which is light or heavy, and so has a natural, or intrinsic, tendency to be moved, respectively, upward or downward, and that which merely accidentally has a tendency to be so moved. 33 See, e.g., Nicomachean Ethics III. 4, 1113a28-29. The association of heat with upward motion and of coldness with downward motion is an old one. The Greeks speak just as casually as we do about things "heating up (anathermainö)" and "cooling down (katapsuchö)." 34 The same point tells against construing the hot and the cold as genera for the light and the heavy (cf. Top. IV. 6, 128a39-b5). 35 Alexander is reported by IMAGEMAQUI, a twelfth century physician, to have ventured this interpretation (see Gannagé 2005, 128), but we lack too much of Alexander's commentary to determine whether he preferred it to the rival hypotheses that he entertained (for just one of which, see note 29, above). Lennox (2002, 191) also suggests that this sort of interpretation merits consideration. 36 For Aristotle, all heat tends up, but not all hot (/cold) things are naturally hot (/cold) and so naturally upwards (/downwards) tending, or light (/heavy). On the distinction between these senses of being hot or cold and possessing a tendency to be moved, see note 32, above. Blood, to which Aristotle is directly attending to in De Somno 3, is a good case in point. By nature, blood is cold (PA II. 2, 648b35-649a20); and to be expected, it is accordingly heavy. But it can, and regularly does, become accidentally hot and rise within the body. Once heated in the torso, blood moves upward because "the hot naturally tends to move upwards, but when it has reached the parts above," and in particular, when it has reached the brain, which is cold and so cools the blood, "it turns back again, and moves downwards in a mass" (De Somno 3, 456b21-24). Only the latter motion is a natural one. 37 See also De Somno 3, 456b22-24, quoted in the preceding note, and 457b31-458a5, where cooling brings about downward motion indirectly, via condensing: "as moisture turned into vapor by the sun's heat is, when it has ascended to the upper regions, cooled by the coldness of the latter, and becoming condensed, is carried downwards (dia tën psuchrotêta autou katapsuchetai kai sustan katapheretai), and turned into water once more; just so the waste exhalation, when carried up by the heat to the region of the brain, is condensed into phlegm while that exhalation which is nutrient and not unwholesome, becoming condensed, descends (katapheretai sunistamenë)." For a passage outside De Somno comparable to those quoted in the body of the paper, consider his treatment of respiration: the chest "is raised in the manner of a forge-bellows when the [hot] breath is drawn in-it is quite reasonable that it should be heat which raises it up (airein to thermon) ... but it collapses and sinks down, like the bellows once more, when the [hot] breath is let out" (De Juv. 13, 474a12-15). Or, again, consider Aristotle's claim that rain, or large drops of falling water, "is due to the cooling [ek gignetai psuchomenës] of a great amount of vapor" (Meteor. I. 11, 347b18-19; cf. Phys. II. 8, 198b19-20). 38 See Physics IV. 8, 215b10-12: "by so much as the medium is . more easily divided, the faster will be the movement." 39 For this analysis, see especially Generation and Corruption II. 2, 329b29-31; Meteorology IV. 1, 378b23-25; and IV. 4, 381b29-30. 40 I am grateful to Karen Detlefsen, Susan Meyer, Charles Kahn, Michael Weisberg, and an audience at Corpus Christi College, Oxford, for comments on an early draft.